Who Wins the World Series Uniform Matchup? The 2017 season’s final two teams are set, with the Houston Astros and Los Angeles Dodgers representing the American and National Leagues, respectively, in the World Series. Ever since the league champions were decided, analysts have been hard at work analyzing pitching matchups, defense, offense and practically every detail of these two teams. Let’s skip ahead to what’s really important: the uniforms. Basing our judgment on nothing but aesthetics, here is who we think will win the championship based on uniforms and colors. Aside from a few outliers, baseball uniforms are synonymous with conservative design and tradition. Several teams feature simplistic logos, old-fashioned script and colored piping along the edges of the uniforms. Measuring based on design, it doesn’t get much better than the Dodgers’ look. The team’s look has gone largely unchanged dating back to their days in Brooklyn, and with good reason. They were the first team to utilize an alternating color for the numbers on the front of their uniforms, and have an instantly recognized interlocking team logo. The Astros are no slouch on their current design, but it’s a bit too safe considering the team’s colorful past. The Dodgers take the first round of this matchup. The Astros broke the collective hearts of baseball fans when they abandoned their navy blue and orange color scheme for a whirlwind of bad 90s design and overdone red and black in the early 00s. With the sale of the team to a new ownership group, the ‘stros reverted back to their classic color combination with some modern day updates. 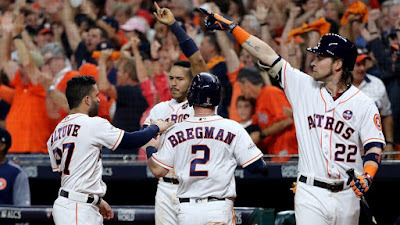 Orange is a criminally underused color in baseball, and the Astros do it right by putting orange piping on their uniforms and wearing orange-brimmed caps on the road. “Dodger Blue” might be a classic color, but the Astros take this round. Just like when it comes to design, the Dodgers are a great example of clean, classic uniform use. They only have one alternate uniform (a road-gray getup with the city name in script) which they haven’t worn once this postseason, and they’ve never fallen victim to the dreaded alternate color shirt. The Astros, on the other hand, occasionally wear a bright orange jersey with their home or road pants as well as a blue top with torso striping that resembles their 1970s sunrise uniforms. This one comes down to personal preference, as orange is a great color but colored baseball shirts are hit-or-miss. 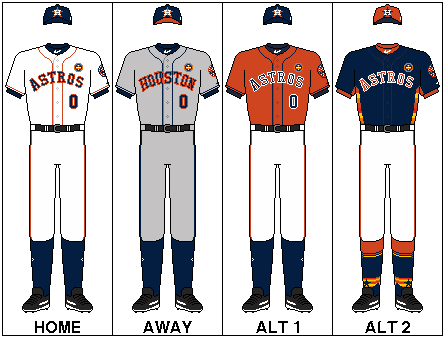 Since the category is uniform flexibility, however, we have to give the edge to the Astros. So there you have it. In a best-of-3 matchup, the Astros pull ahead of the Dodgers in the uniform aesthetics division. In real life, this series is bound to go to the end of the wire, giving fans plenty of chances to see these two well-dressed teams go head to head. Which uniform combo do you like best? Share with us in the comments below and enjoy the games! While baseball fans are gearing up to pull their hair out with every gut-wrenching pitch of the postseason, hockey fans are just settling in for a new season of hard hits and impossible saves. The 2017-2018 season brings with it some changes, as Las Vegas begins play as an expansion team and several role players from last year’s playoff teams have found new homes. Parity is more evident in the NHL than in most other American sports leagues, as roster depth plays a more prominent role in the flow of each and every game. With that being said, the season is bound to have some twists and turns. 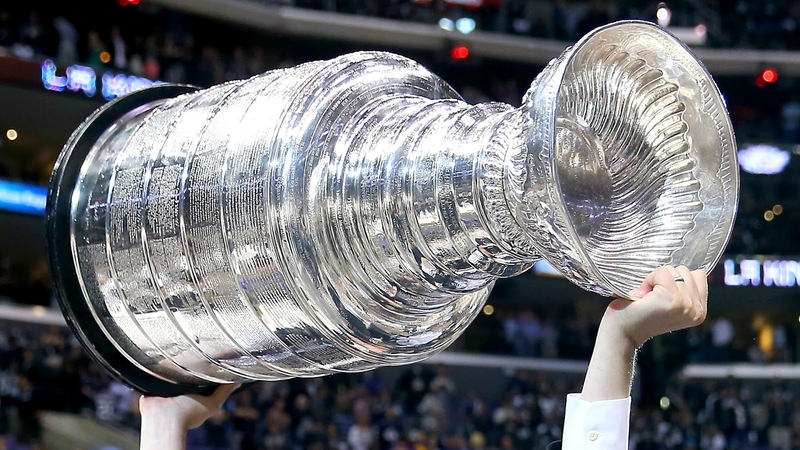 In no particular order, here are our predictions for the eight teams emerging from each conference, as well as a shot-in-the-dark guess for the Stanley Cup Finals. Nashville Predators – They took the league by storm when they dismantled opponent after opponent in the playoffs before running into Pittsburgh. It won’t be a one-year fluke. Edmonton Oilers – Including the Oilers in the postseason conversation just feels right and as it should be. The emergence of Connor McDavid has Edmonton on the precipice of Western royalty. Dallas Stars – They have a great first line of players on their squad, making this the year they’ll return to the top flight of the Western conference. Anaheim Ducks – They’ve become a sure-thing winner in the Pacific for some time now. That won’t change in 2017. Winnipeg Jets – They just missed out on the playoffs last season but have what’s needed to grab a wild card spot. Calgary Flames – Considering the stacked competition, it won’t be a deep run for Calgary, but they’ll make it back into the postseason discussion. San Jose Sharks – Seemingly always the bridesmaid but never the bride, the Sharks can’t figure things out in the postseason. They’ll make it back this year but will fizzle out quickly. Chicago Blackhawks – They’ll eke their way in, but Chicago will be in the playoffs come May. A Jekyll-and-Hyde team as of late, how they make use of their scoring chances will dictate how deep they get in the tournament. Pittsburgh Penguins – Losing a few key role players, Pittsburgh is still Pittsburgh. Take it to the bank. Washington Capitals – The Penguins are Alex Ovechkin’s (and Washington’s) white whale. Can they exorcise their playoff demons this season? Tampa Bay Lightning – You could argue that last season would’ve turned out better if it weren’t for nagging injuries. Even with that, the Lightning just missed the playoffs. If the injury bug doesn’t hit twice, Tampa Bay could be the belle of the ball in the Eastern. Ottawa Senators – They were so close to the Finals last year that it’s hard to argue they won’t be in the picture again this season. Carolina Hurricanes – They’ve quietly added great pieces for better depth and should turn some heads even against the most difficult teams in their division. Columbus Blue Jackets – That potent offense isn’t going anywhere, although they will have to fend off a surging Rangers team to avoid wild card seeding. Montreal Canadiens – The Senators will battle them for top seeding, but this playoff stalwart isn’t slipping far down the ranks. Florida Panthers – Move over, Toronto, the Panthers were just a handful of good wins away from the playoffs last season. They’re coming for your spot. Nashville’s run at the Finals came out of nowhere last season, but it wasn’t the first time an eighth seed team took down the big boys, as the Kings did a few seasons ago. With that in mind, it’s hard to make an educated guess on how the playoffs will turn out. We’re guessing Nashville will hold off a pesky Edmonton squad and meet Tampa Bay for the title. The Predators will avenge their loss from last season and hoist their first Stanley Cup. If you’ve been watching pro football games for the past several years, you’ve undoubtedly noticed the use of pink-colored accessories throughout the month of October. Back in 2009, the league began using the month of October (referred to as “Pinktober”) as an opportunity to raise awareness, support and funds for breast cancer screening and research. Logos on the field were trimmed in pink. Cleats, gloves, mouth guards and towels were pink. The league sold pink-themed items, with proceeds going to screenings and research. It was a unique promotion for a good cause that has been mimicked in college and high-school ranks. Starting this season, the month of October will shift away from exclusive support of breast cancer to cancers in general. Teams will be allowed to choose any detectable cancer they wish and change their stance from season to season, meaning more cancers that are detectable will get the exposure and awareness needed to raise funds. Several detectable cancers have an associated color, just like breast cancer. Prostate cancer, for example, has the associated color of light blue. Ovarian cancer is associated with the color purple. How teams will acknowledge their support for screenings and research remains to be seen and probably won’t affect uniform accessories for the 2017 season. While the promotional angles are worked out, chances are that portions of a team’s sale of tickets, concessions or souvenirs during home games will be donated directly. Expanding the league’s promotional schedule to include more than just breast cancer awareness isn’t an entirely new concept. 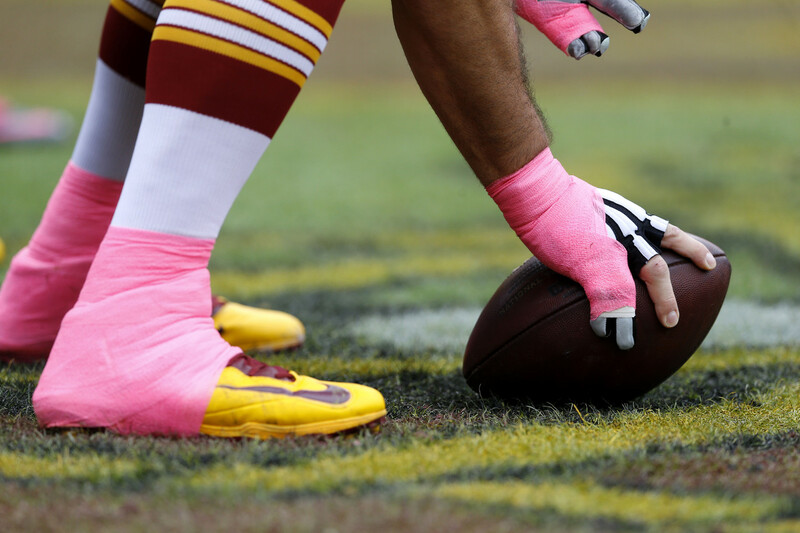 Over the last few seasons, the league has designated certain weekends for players to wear cleats supporting causes specific to them, ranging from mental health to social issues. In fact, several players involved in the players’ association are pushing for more months of the season to be dedicated to using their celebrity and media exposure for an even wider array of causes. What charitable causes would you like to see pro sports leagues - especially the NFL - promote during their games? Share with us in the comments below.